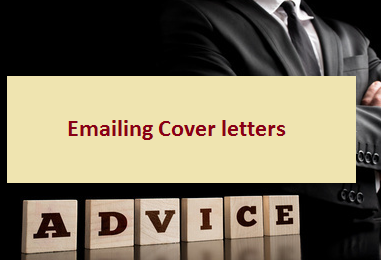 In this article 'e-mailing cover letters', you'll get more information and details help with your career knowledge, feel free to copy or share. Something happens to people when they get online. Maybe it's the instant access, maybe it's the "I-could-be-naked" anonymity, but when people get online they sometimes get overly casual and informal. This might be fine when your talking to your buddy in Omaha or the sweetheart you just met in a chatroom, but it doesn't work well when you're trying to get business done. Just because you're communicating online does not mean you should consider yourself exempt from any of the formalities of paper-based communication. Online cover letters are notoriously awful, poorly written throwaways of fewer than three lines whose only purpose is to say "I'm applying, this is my resume, have a nice day." When formatting the cover letter, stick to left-justified headers and four-inch wide text lines in your paragraphs. You never know when the address you're mailing to has a small e-mail-page format that will awkwardly wrap text around the screen. Also, many e-mail systems cannot handle text enhancements like bolding, bulleting or underlining, so play it safe by using CAPITAL LETTERS -- or dashes -- if you need to make an emphasis. Anil Dash, the former chief information technology officer for an online music video production studio in Manhattan, lost his job this January when the company fired nearly all its employees. Since then, Dash figures he's applied for more than a dozen jobs, contacting every one of the potential employers - befitting an out-of-work CIO - through e-mail. But every time he prepares another e-mail, he faces a choice. Should he bother to write an e-mail cover letter, the sort of thing he'd do if he were mailing the resume, or should he merely dash off a few lines to the effect of, "Hi, I'm interested in your job, and I've attached my resume as a Word file. Thanks." "I do cover letters for jobs I really want," Dash says. "For ones I don't care about, I just spam them." According to recruiting experts, Dash is doing the right thing by writing extensive e-mail cover letters. Even though cover letters came of age in the age of pen and paper (or typewriter and paper), they still have a place in the 21st century, when want ads, resumes, and interviews all fly over virtual networks. "It's going over the Internet, but it's the same product," Madeline Miller, the manager of Compu-Type Nationwide Resume Service in upstate New York, said of e-mail cover letters. "The cover is very important and it should be the same quality if you were to mail it." Since e-mail messages generally tend to be conversational and quickly written, many people aren't used to drafting carefully written e-mail cover letters. But Miller said any applicant who creates a fully-fleshed e-mailed cover letter has an advantage over an applicant with a more slapdash cover letter. "There is a tendency to jot off a few lines, and people might write, "I'm applying for this job, here is my resume," Miller said. "But if there is a cover letter, that could put somebody over the top." But at the same time, make sure your e-mailed cover letter isn't a chore to read. If brevity is a virtue with conventional cover letters, it's a necessity for e-mailed cover letters. Reesa Staten, the research director for OfficeTeam, a staffing service firm, says e-mailed resumes shouldn't run more than two or three paragraphs. "You want to include the same type of information, albeit in a shorter version," Staten said. "What you don't want to do is rehash your resume. There's no need to restate what you've done in the past. What you want to do is tell them where you learned about the listing, why you're right for the job, and how they can reach you." If you really want the job, follow up an e-mailed cover letter and resume with a hard copy you mail. Make sure this hard copy includes a cover letter, too, that restates who you are and why you're qualified. Somewhere in the cover letter, be sure to write, "I recently e-mailed you my resume and I'm following up with this hard copy." Why should you do this? A hard copy gives your resume another chance for exposure and makes it easier for a potential boss to pass around or file your cover letter and resume. In cases where your e-mailed cover letter and resume have been overlooked in someone's in-box or rendered inaccessible by a computer glitch, a hard copy may be your only chance for exposure. If you're including a resume as an attachment, first make sure the prospective employer accepts attachments. Then, in your cover letter, mention the program you used to create your attachment. ("I've enclosed a cover letter written in Microsoft Word 2000.") It's also a good idea to include a cut and paste text version of your resume in addition, in case the person reading the resume doesn't have the software to open your attachment. With any resume file you're attaching, open it first to make sure it's updated, error free, and the version of your resume you want to send. Sending a virus is tantamount to sealing your job-doom. Save a copy of whatever you send by including your own e-mail address in the "BCC" field or by making sure a copy goes to your "Sent mail" folder. This allows you to resend the letter if a problem pops up. Lastly, don't fill in the "to" field with the recipient's e-mail address until you've finished writing and editing the cover letter and resume. This prevents you from accidentally sending off the message before it's ready.